Bodega Taqueria y Tequila is a taco lovers’ heaven as this is where real tacos and other authentic Mexican foods are made. Chef Bernie Matz has created a menu that captures the true essence of true Mexican street food. With extensive travels throughout Yucatan and Monterrey, Mexico, Chef Matz has transformed his acquired knowledge about authentic Mexican food into a menu that truly represents all that Mexican street food really is. Diners can enjoy their eats in a casual environment that is both comfortable and fun. Bodega Taqueria y Tequila is open 7 days a week. The specific days and hours of operation are as follows. To request a nightly table reservation, email tablereservations@bodegasouthbeach.com. Antojitos - Chips and salsa, Caesar salad, queso frito or queso fundido, elote, ceviche, quinoa bowl, bodega guacamole, and more. Tacos - Pescado, barbacoa, pollo, camaron BLT, hongos, al pastor, Texas BBQ carnitas, steak chimichurri, and more. Burritos - Pollo, BBQ carnitas, hongos, baha, milanesa, frita, cubanito, flame broiled pork, phili, flame broiled chicken, and more. Extras - Charred pineapple slaw, rajas, queso, refrito, fried jalapeno peppers, side of guacamole, and picked onions. Alcoholic Drinks - An assortment of cocktails, specialty drinks, and shots are available. Daily Specials - Ask about the daily specials. Takeout ordering is available by placing an order over the phone by calling (305) 704-2145. There is also the option of ordering food online for delivery via GrubHub. To place an online order for Bodega, visit the Bodega website or visit GrubHub and search for Bodega Taqueria y Tequila. 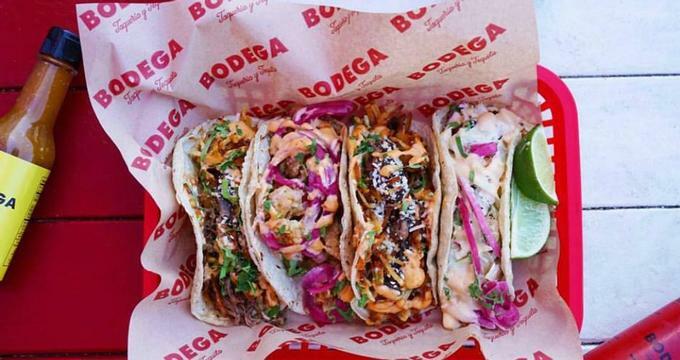 Come enjoy some delicious tacos and drinks at one of Bodega’s events. Some of the more popular events include the daily happy hour from 6:00pm to 8:00pm. At this daily happy hour, guests may enjoy $2 tacos, $3 chips and guacamole, $4 chips and salsa as well as several specially priced draft beers, tequila shots, and draft beers. Other events at Bodega Taqueria y Tequila include Live Music Wednesdays. Each Wednesday, enjoy live music by Randy Singer Music. Doors open at 6:00pm and the live music starts at 9:00pm. To keep abreast of the events happening at Bodega Taqueria y Tequila, subscribe to receive email updates. Patrons can also visit their website to find out about the latest events. Bodega Taqueria y Tequila offers catering services that can easily be placed online. Bodega Taqueria y Tequila offers culinary and mixology classes, where participants can learn how to make signature drinks as well as guacamole and ceviche. Class options include a 1-hour mixology class with the option to add on a culinary demonstration with or without a cocktail. For more information on the mixology and culinary classes, contact the director of events, Ana Flietas at eventinquiries@bodegasouthbeach.com. Now customers can enjoy Bodega Taqueria y Tequila at the American Airlines Arena. Visit sections 108 and 124 to enjoy tacos, burritos, nachos, and other foods while enjoying an event here.